Homes, dams, artistic installations. We are often inclined to believe that humans are the only animals able to erect buildings and other constructions that modify the environment to their own advantage, but read here and you will find otherwise! From insects to birds, from spiders to fish, architecture and design are used by numerous animal species to build homes, feed themselves, defend themselves and raise their young, but also to court and win their mates. Let’s begin at the bottom of the sea, with the creativity – all the more amazing perhaps because little known to the general public – of some species of puffer fish. This fish, subdivided by scientists into 120 different species, is best known for its ability to puff itself up like a ball when attacked, to appear larger to its predators. In the Sea of Japan, however, there is a species of puffer fish that has another gift that is truly incredible: it builds geometric sand sculptures to attract passing females and persuade them to lay their eggs there. By moving its fins on the seabed, this little fish (about 13 centimetres long), creates furrows in the sand which, viewed from above, seem like authentic abstract works of art. The circles thus drawn may reach a diameter of two metres and the outer edge may be decorated with shells or fragments of coral. From the mysteries of the deep blue, let’s now look at those of the most numerous class of animals, that of insects, which on its own includes over one million species. Here too, there is no lack of architects. Examples are social insects like bees, wasps and ants. In fact, it is well-known that bees, which live in colonies with a well-defined social structure, build hives that in a certain sense are veritable cities made up of numerous hexagonal cells and inhabited on average by 50 or 60 thousand individuals. Wasps too have more or less complex forms of social organisation and build nests, often on more than one level, the basic cell of which is hexagonal, like those of bees; in practice, these are authentic multi-storey buildings which, in may cases, instead of having foundations set in the ground, are built vertically from the top down starting from a single anchor point at the top. 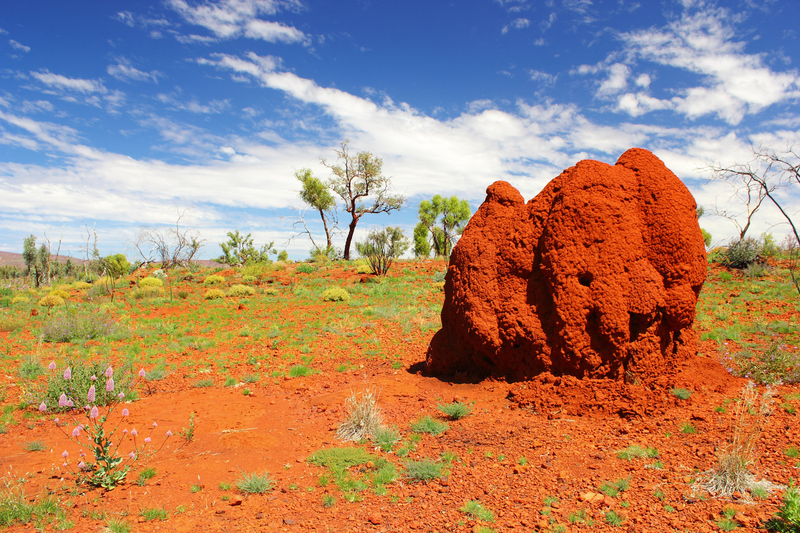 But let’s look at another group of insects, termites, which build “cities” that in some cases may be buried down to dozens and dozens of metres below ground and emerge for several metres in height. These insects, which have a very complex social organisation, with part of the population that is sterile (made up of soldiers and workers) and another fertile, build nests that are totally isolated from the outside world, subdivided according to the functions that it performs. For example, there is a cell for the king and queen and for laying eggs, as well as a network of tunnels and a system of corridors. What is perhaps most surprising is the fact that there are also so-called “gardens”, where the termites “grow” special fungi, providing them with plant material that makes them more digestible for the termites themselves. According to fairly recent research, the external mounds of termitaries are thought to serve for ventilation (made possible by a system of tunnels) that appear to provide a sort of air conditioning while at the same time maintaining a suitable level of humidity and exchange of oxygen. In short, it would seem that we are not the only ones to succeed in having houses with areas allocated for specific functions. And we are not the only ones who feel the need – some more than others… – to keep our homes tidy. The Vogelkop bowerbird, for example, builds an actual hut for mating. With roofs made with twigs, floors covered with moss and various colourful decorations around the entrance according to the taste of the architect, these constructions are not mere nests, but veritable “pieds-à-terre”. Some males prefer lighter colours, such as orange for example, while others prefer darker tones and females searching for a mate choose one partly based on these constructions surrounded by patches of colour. It would not be possible to end this survey of skilled engineers without mentioning beavers. Perhaps less attentive to details of colour, but certainly very sophisticated and precise in their hydraulic works, these mammals are in fact known all over the world for their skill as builders of extraordinary dams. Using their four incisors – two on the lower jaw and two on the upper jaw, yellow-orange in colour, since their enamel is strengthened by iron – these rodents succeed in felling trunks with quite large diameters (up to 75 cm), which they use to build barriers along rivers. Their dams are completed with smaller-sized branches, stones and leaves and are cemented with mud. The largest beaver dam ever discovered can be seen even from satellites and was photographed for the first time in 2007: it is in Canada and is 850 metres long. As time goes by, the dams are strengthened by the vegetation that grows on them and by everything that, transported by the current, becomes trapped against the barrier. Beavers are also excellent repairers: sensitive to the sound of the water, if the dam shows signs of collapse, they immediately take action to “plug the holes”. And that is not all, because often downstream from the main dam, they built other barriers to raise the level of water below the first dam thus balancing the water pressure upstream. Yet why do they work so hard and why do they build such complex and difficult constructions? According to biologists, the advantage is that these dams create and environment and an entrance to their lodges that is much safer for the beavers, who are skilled swimmers, but also extremely slow on dry land. In short, there is no denying it: some animal species are just as good as good as human starchitects, and it is certainly no coincidence that many architects and designers take inspiration precisely from the solutions invented by Mother Nature.